قاسمی, احمدرضا, محمدی, محمدمهدی. (1393). محاسبه ضرایب کالیبراسیون برای تعیین تنش‌های پسماند در چندلایه‌های فلز- کامپوزیت به روش سوراخکاری مرحله‌ای. علوم و فناوری کامپوزیت, 1(1), 35-44. احمدرضا قاسمی; محمدمهدی محمدی. "محاسبه ضرایب کالیبراسیون برای تعیین تنش‌های پسماند در چندلایه‌های فلز- کامپوزیت به روش سوراخکاری مرحله‌ای". علوم و فناوری کامپوزیت, 1, 1, 1393, 35-44. قاسمی, احمدرضا, محمدی, محمدمهدی. (1393). 'محاسبه ضرایب کالیبراسیون برای تعیین تنش‌های پسماند در چندلایه‌های فلز- کامپوزیت به روش سوراخکاری مرحله‌ای', علوم و فناوری کامپوزیت, 1(1), pp. 35-44. قاسمی, احمدرضا, محمدی, محمدمهدی. محاسبه ضرایب کالیبراسیون برای تعیین تنش‌های پسماند در چندلایه‌های فلز- کامپوزیت به روش سوراخکاری مرحله‌ای. علوم و فناوری کامپوزیت, 1393; 1(1): 35-44. چند لایه‌های فلز- کامپوزیت دسته جدیدی از کامپوزیت‌های هیبریدی هستند که از ترکیب لایه‌های فلزی و کامپوزیت ایجاد می‌شوند و به واسطه جدید بودن و ویژگی‌های برجسته آنها، پژوهش‌ها روی این کامپوزیت‌ها در حال توسعه است. یکی از زمینه‌های ناشناخته در چندلایه‌های فلز-کامپوزیت، اندازه‌گیری تنش‌های پسماند حرارتی به‌وجود آمده در فرآیند ساخت است. تنش‌های پسماند در این نوع از کامپوزیت‌ها به دلایل متفاوتی همچون خواص مکانیکی- حرارتی متفاوت کامپوزیت و فلز، چیدمان متفاوت لایه‌ها، سیکل پخت کامپوزیت و روش ساخت چندلایه کامپوزیتی، امری اجتناب ناپذیر است. اندازه‌گیری تنش‌های پسماند درچندلایه‌های هیبرید به روش سوراخکاری مرکزی به دلیل تغییر جنس در عمق سوراخ امکان پذیر نبوده و توسعه روش سوراخکاری مرحله‌ای برای تعیین تنش‌های پسماند در هر لایه لازم است. در این تحقیق با استفاده از روش اجزای محدود، ضرایب کالیبراسیون، برای ارتباط کرنش‌های رها شده و تنش‌های پسماند محبوس در هر لایه از چند لایه‌ فلز- کامپوزیت محاسبه شده است. مقایسه نتایج این تحقیق با نتایج سایر محققین برای کامپوزیت لایه‌ای، صحت روش و محاسبات انجام شده را تائید می‌نماید. همچنین نتایج این تحقیق نشان می‌دهد به دلیل قرار گرفتن لایه‌های کامپوزیتی در ساختار چندلایه‌های فلز- کامپوزیت، ماتریس ضرایب کالیبراسیون مربوط به لایه‌های فلزی، از حالت متقارن خارج شده و برای لایه‌های فلزی نیز ماتریس ضرایب کالیبراسیون لازم است. Carrillo, J.G. and Cantwell, W.J. : Mechanical properties of a novel ﬁber-metal laminate based on a polypropylene composite. Mechanics of Materials, vol. 41, 2009, pp. 828–838. Sinmazcelik, T., Avcu, E. and Coban, O.: A review: Fibre metal laminates, background, bonding types and applied test methods. Materials and Design, vol. 32, 2011, pp. 3671–3685. Alderliesten, R.: On the development of hybrid material concepts for aircraft structures. Recent Patents Engineering, vol.3, 2009, pp. 25-38. Shivakumar, P.S., Galaveen, S.C., Siddaramaiah and Jawali, D.: Effect of glass/nylon coated aluminum fibers on torsional properties of epoxy polymer composite shafts. Malaysian Polymer Journal, vol. 9, no.1, 2014, pp. 33-38. Ardakani, M.A., Khatibi, A.A. and Ghazavi, A.: A study on the manufacturing of Glass Fiber Reinforced Aluminum Laminates and the effect of interfacial adhesive bonding on the impact behavior. International Congress and Exposition, 2008. Mahesh, M., Kumar, A.S.: Comparison of Mechanical Properties for Aluminium Metal Laminates (GLARE) Of Three Different Orientations Such As CSM, Woven Roving and 45o Stitched Mat. Journal of Mechanical and Civil Engineering (IOSR-JMCE), e-ISSN: 2278-1684, p-ISSN: 2320-334XX, pp. 09-13. Rossini, N.S., Dassisti, M., Benyounis, K.Y. and Olabi, A.G.: Methods of Measuring Residual Stresses in Components. Materials and Design, vol. 35, 2012, pp. 572–588. Safarabadi, M.: Prediction of calibration factors of the hole-drilling method for orthotropic composites including hybrid interphase region. Journal of Composite materials, DOI: 10.1177/0021998314529680, 2014. Standard Test Method for Determining Residual Stresses by the Hole-Drilling Strain Gage Method, Annual Book of ASTM Standard, 03.01, 2008. Shokrieh, M.M. and Ghasemi, A.R. : Simulation of Central Hole-Drilling Process for Measurement of Residual Stresses in Isotropic, Orthotropic, and Laminated Composite Plates. Journal of Composite materials, vol. 41, no. 4, 2007, pp. 435-52. Shokrieh, M.M. and Ghasemi, A.R. : Determination of Calibration Factors of the Hole Drilling Method for Orthotropic Compositesusing an Exact Solution. Journal of Composite materials, vol. 19, 2007, pp. 2293-311. Ghasemi, A.R., Behrooz, F.T. and M.M. Shokrieh: Determination of non-uniform residual stresses in laminated composites using integral hole-drilling method: Experimental evaluation. Journal of Composite Materials. vol. 48, no. 4, 2013, pp. 415-425. Ghasemi, A.R. and M.M. Shokrieh: Residual Strains Measurement and Calculating Residual Stresses in Composite Laminates Using the Integral Method. 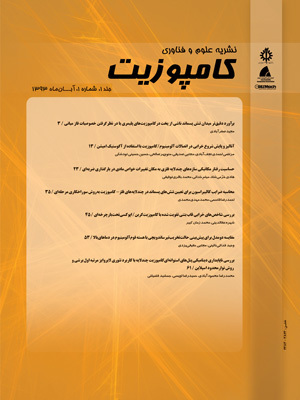 Journal of Computational Methods in Engineering (In Persian), vol. 28, vo. 2, 2009, pp. 81-93. Ghasemi, A.R. and M.M. Shokrieh: Development of an Integral Method for Determination of Non-uniform Residual Stresses in Laminated Composites. Journal of Polymer Science and Technology (In Persian), vol. 21, vo. 4, 2007, pp.347-355. Akbari, S., Behrooz, F.T. and Shokrieh, M.M. : Characterization of residual stresses in a thin-walled ﬁlament wound carbon/epoxy ring using incremental hole drilling method. Composites Science and Technology, 2014, vol. 94, pp. 8-15. Shokrieh, M.M. : Residual stresses in composite materials, First ed., WoodheadPublishing Limited, Cambridge, pp. 76-120, 2014. Schajer, G.S. : Relaxation methods for measuring residual stresses: techniques and opportunities. Experimental Mechanics, vol. 50, no.8, 2010, pp. 1117–1127. Schajer, G.S. and Prime, M.B. : Use of inverse solutions for residual stress measurement. Journal of Engineering Materials and Technology, vol. 128, no. 3, 2006, pp. 375-382. ANSYS Help System. Analysis Guide and Theory Reference, Ver. 14.5; 2010. Akbari, S., Behrooz, F.T. and Shokrieh, M.M. : Slitting Measurement of Residual Hoop Stresses Through the Wall-Thickness of a Filament Wound Composite Ring. Experimental Mechanics, vol. 53, 2013, pp. 1509-1518.